With little fanfare on Monday, President Donald Trump signed an executive order that LGBTQ advocates say rolls back lesbian, gay, bisexual and transgender rights and breaks a promise to that community not to make such changes to existing policy. The executive order revokes key components of the Obama administration's previous executive order banning federal contractors from discriminating against employees on the basis of sexual orientation or identity, gay rights advocates say. Organizations representing the LGBTQ community say the "Presidential Executive Order on the Revocation of Federal Contracting Executive Orders" hobbles several of Obama's previous orders including the "Fair Pay and Safe Workplaces" order by revoking the requirement that companies seeking federal contracts prove they've complied with federal laws banning discrimination based on sexual identity or orientation. The Obama-era regulations were set to take effect in 2016, but were stalled when a Texas association of builders and contractors filed a lawsuit. "It definitely sends a message that this administration does not prioritize these laws, or think that investigating compliance is important," said Claudia Center, a disability rights attorney at the ACLU. The message being sent, say advocates, is that the federal government will look the other way if the companies it works with are hit with claims of racism, sexual harassment, unfair firings, and other forms of worker mistreatment. 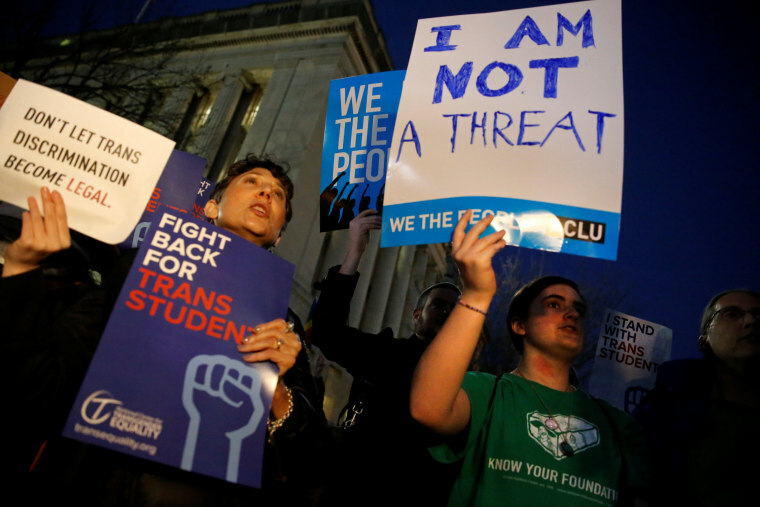 LGBTQ advocates say they were particularly rattled by Trump's Monday signing, since revoking the compliance requirement would appear to make existing protections against gender identity and sexual orientation discrimination meaningless. In January, the White House issued a statement in response to panic over a rumored executive order that would severely impact LGBTQ rights — specifically promising not to over turn Obama's protections for LGBTQ workers employed by federal contractors. "The executive order signed in 2014, which protects employees from anti-LGBTQ workplace discrimination while working for federal contractors, will remain intact at the direction of President Donald J. Trump," read a White House statement issued January 31st. The statement also declared that Trump was "proud" to be the first GOP nominee to mention LGBTQ Americans at a convention, and of "pledging then to protect the community from violence and oppression." Lambda Legal senior counsel Camilla Taylor said that while Trump did not overturn the specific order that added sexual orientation and gender identity to protected worker classes, he made it tough to actually enforce. "The threat of loss of a federal contract is an incredibly powerful way of making sure companies follow the law," Taylor said. The White House told NBC News LGBTQ protections remain largely in place in the executive order and denied the premise that they didn't uphold their promise.